It would be easy enough to say that, like Alain Ducasse, Gordon Ramsay, Nobu Matsuhisa and a dozen other culinary celebrities, Michael White long ago left his kitchen stoves behind in exchange for global entrepreneurship. But in fact, at least with his New York Italian operations -- Marea, Osteria Morini, Ai Fiori, Costata and now Ristorante Morini -- you've still got a good chance of finding White in his chef's coat, bounding from the kitchen and making sure everyone is enjoying themselves. Ristorante Morini (1167 Madison Avenue; 212-249-0444), named after the Italian banker who in 1970 opened the great ristorante San Domenico in Imola, Italy, where White learned his craft, is a far more upscale version of his decidedly rustic Osteria Morini downtown, with its brick walls, wooden tables and copper utensils. The Upper East Side demanded a more soigné style: The restaurant is located on two levels done in soft colors of mahogany and beige; downstairs is the bar and small dining room, upstairs (above) a larger one, with well-set tables, fine glassware and crisp tablecloths. The whipped cream-like chandeliers throw a flat light, and the rooms could use some color, but the lighting itself makes it easy to see the well-heeled and well-dressed clientele that has packed the place since it opened two months ago. 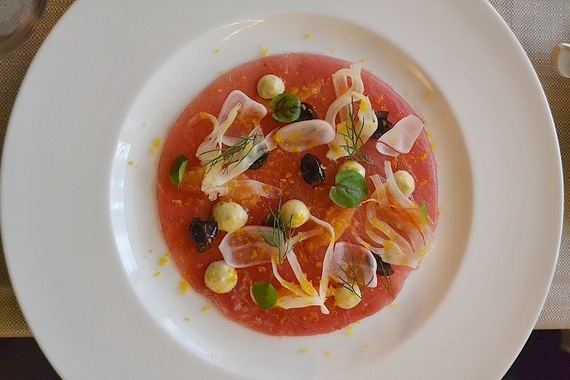 As at his Italian seafood restaurant Marea, White is offering crudi -- Italian sushi -- as well as pricey caviar, though the menu does not say where the caviar is from. There is also a slew of appetizers that includes Nantucket Bay scallops (in season) with pistachios and Sicilian herbs, as well as carpaccio sliced from Piemontese beef and dressed with squaquerone cheese and lemon. There's a similar dish made from tuna, too. 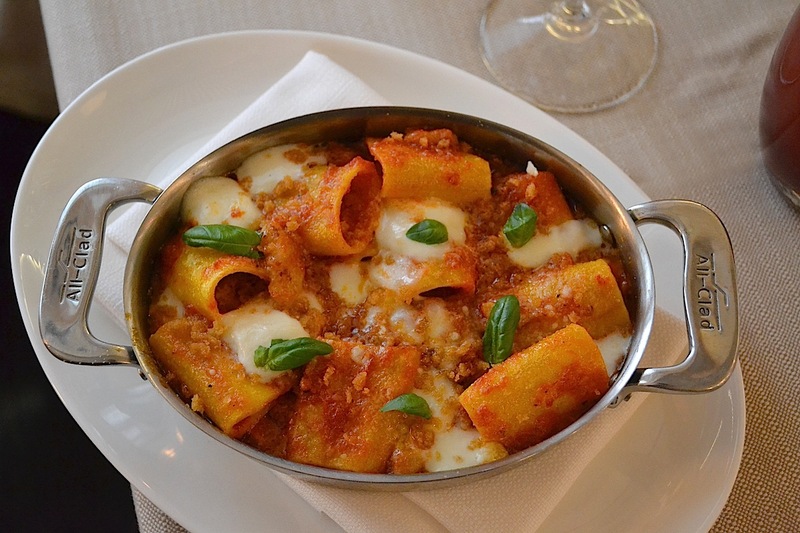 Pastas ($22-$29 for full portions) have always been one of White's strongest talents, from a simply sauced rigatoni with tomato pulp and basil to flat paccheri noodles (below) with a spicy amatriciana sauce and morsels of buffalo mozzarella. Tortelloni are fattened with robiola and mascarpone cheeses then simply drizzled with butter and sage. Ribbons of fresh tagliatelle is treated to wild mushroom sautéed in garlic and olive oil with parsley, while the ridged garganelli pick up a hefty long-cooked bolognese doused with sangiovese wine and a good dose of Parmigiano cheese. There is also risotto with lobster and prawns in a coral butter shot through with cognac. Tasting these pastas you are reminded that the best Italian cooks never elaborate when simplicity is far more appealing, and that pasta must be treated with an eye to the shape and texture of the noodles and stuffed wrappings as much as to the appropriate sauce. 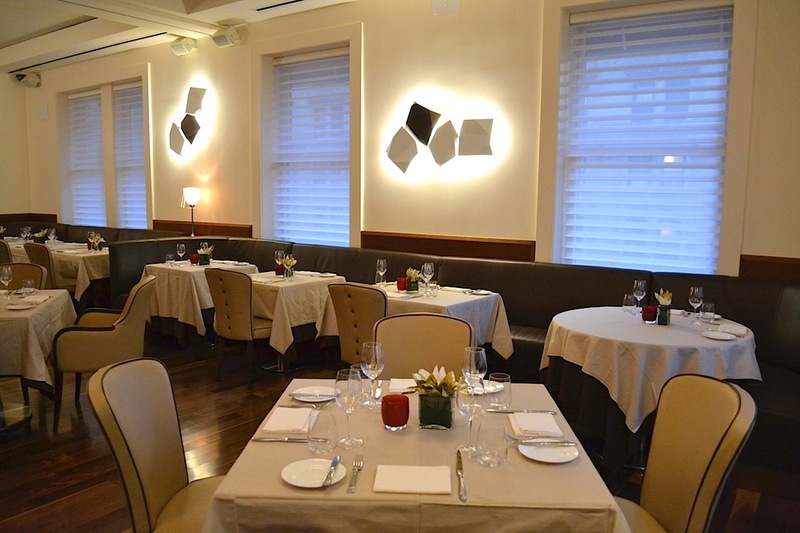 Nothing at Morini seems out of place. The only disappointment was a classic ferratini alla carbonara, with warmed egg yolks, guanciale bacon and pecorino cheese that all together lacked flavor and was somewhat gummy. 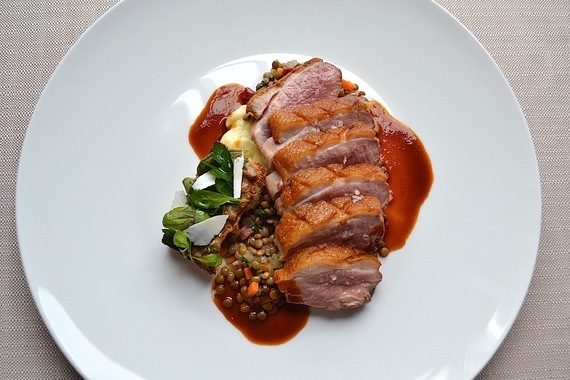 Many people might stop after the pasta dishes, but there are several excellent "secondi" main courses ($35-$59) here I recommend, not least the impeccably grilled duck breast (below) with lusty cotechino pork sausage, tender lentils and a huckleberry sauce. Lamb chops were top-quality, dusted and crusted with pecorino served with broccoli di rabe and chickpea polenta, scented with rosemary. Short ribs are luxuriously cooked for hours in red wine, served with polenta, black cabbage and a tangy gremolata of hazelnuts for added texture. A special one evening that raised some eyebrows about the price was a veal alla milanese at $59. Even with some black truffles shaved on top of the dish, that's a very high figure for breaded, fried veal cutlet -- even more than the now infamous $50 version at Carbone in Greenwich Village. Even on the Upper East Side, people with money sometimes do balk. Neither is the wine list inexpensive but the selection is extraordinary, especially in rare Italian bottlings. 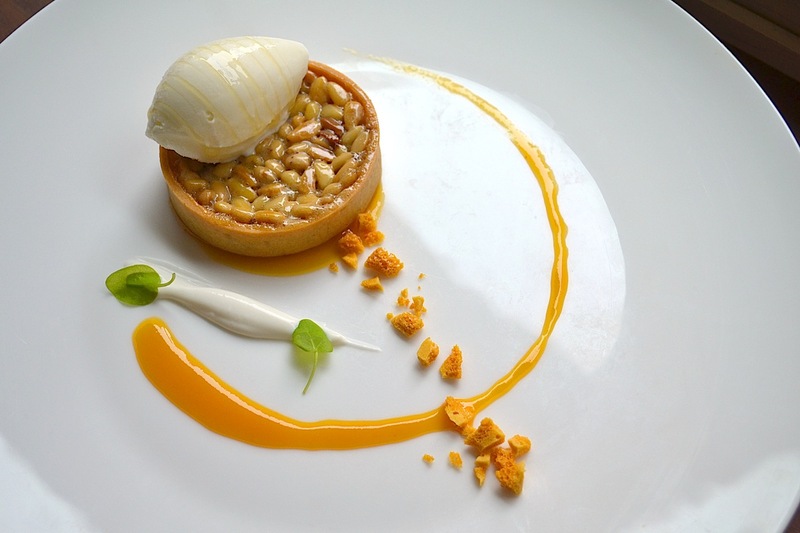 Desserts, by patîssier Rowan Johnson and Robert Truitt ($13-$16), are not easily split for two, but you might try with the cheesecake with gingerbread and a grapefruit sorbet or the pine nut tartlet (below) with rosemary meringue and a honey ricotta gelato. It is not just to White's credit that he tries to visit his restaurants on a regular basis and do some cooking when he's there, but also to what is largely an unerring sense of what people have come to expect in modern Italian cuisine -- something White has been teaching them to appreciate in various forms for several years now. Ristorante Morini is open for lunch Mon.-Fri., and for dinner nightly.